So…a mushroom walks into a bar. The bartender looks up and immediately shouts “Get out, you’re not welcome here.” The mushroom replies “Why not, I’m a fungi.” Fungi…fun guy…get it…yeah, pretty lame, but it is the only joke that I can remember the punchline. I have a terrible time remembering punchlines. I have a lot of really funny friends….epically funny. A good portion of our time together is spent laughing, and why would you have it any other way? Life is short, laugh a lot. And if you can be around a campfire while you are doing it, all the better! If you are wondering where this post is going, it’s about honoring the humble mushroom. This recipe is inspired by a dish I had at Crush in Arcata, California, and after one bite I was indeed in love. It was a special that evening, I don’t believe it is on the regular menu. But should you be there when it is, you must try it. I use shiitake mushrooms for this recipe, but assorted wild mushrooms, crimini or even button mushrooms would work. It’s a delicious topping for steaks, chicken and fish, and can stand on its own as a decadent side dish or as an appetizer served atop some crusty toasted bread. The recipe has a lot of butter in it, so just add another mile to that day hike, if you are worried about that kind of thing. 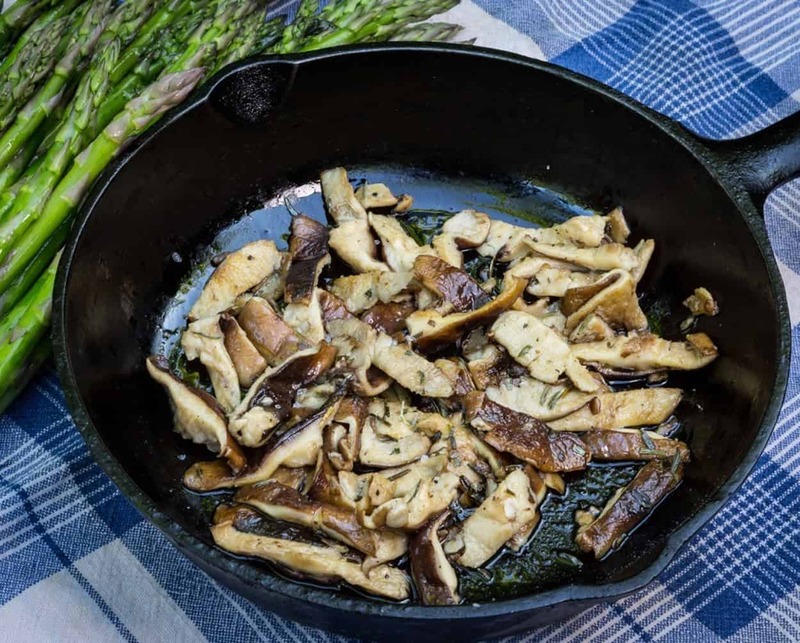 Tarragon Shiitake Mushrooms are an easy, decadent side dish. Remove the tough stems from the shiitakes, discard. Melt 4 TBS of the butter in a pan over medium heat. Remove the pan from the heat, stir in the remaining 1TBS of butter.